“Into what then were you baptized?” (Acts 19:1-7) That’s St. Paul’s question to each of us. How often do we recall our baptism? What difference does it make or is it making in your life today? How often do we return to the water of our baptism? Baptism isn’t just for babies or newcomers to the church. Though we may ritually or liturgically be baptized only once baptism isn’t a one time event in our lives. Our baptismal waters are as real, deep, wet, and powerful today as they were on the day of our baptism. Your baptism, however, did not make you good. It did not make you acceptable to God. It did not cause God to love you. It revealed those to already be the truth. It revealed that God sees you and knows you. It revealed that your life matters. Isn’t that what we see and hear today on the Feast of the Baptism of Jesus? Up to this point Jesus hasn’t done a thing. He hasn’t survived the wilderness and it’s temptations. He hasn’t healed anyone. He hasn’t taught. No one has been raised from the dead. No miracles have been performed. He has not been crucified or resurrected. So what did Jesus do? He showed up to be baptized and to let truth be spoken. And it was. The Father named Jesus his Son, called him Beloved, and expressed his pleasure about him. What had Jesus done to get or cause that? Nothing. It was all gift. 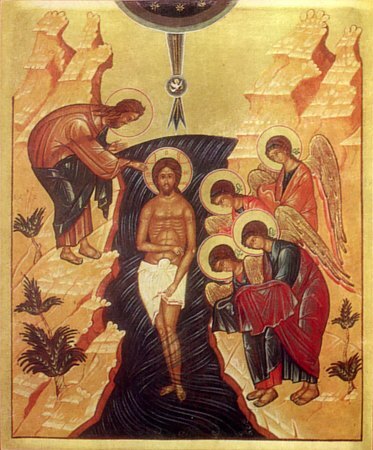 That is the baptism into which you and I were baptized. Those are the waters to which we return again and again. We return to remember and claim once again the baptismal truth of our lives. Even if you do not know or believe that about yourselves I’ll bet you understand and know what I am talking about. You’ve seen it happen with new parents. You may have even done it to a child. It’s what your parents, grandparents, a relative, or a friend did to you and it’s probably what you who are parents or grandparents did to your child or grandchild. You picked that little one up, held him or her close and said, “I love you. You are beautiful. You are perfect.” You kissed that child, called his or her name, and declared your pleasure. So tell me. What made that child good, acceptable, lovable? What did that child do to cause you to behave in that way? Nothing. He or she showed up and you spoke a truth from deep within you. None of this necessarily makes life easy. It doesn’t magically fix our life’s or world’s problems. Instead, it reveals life to be holy, sacred, and worth the effort. It let’s us start from a new place and with a different truth. Where we begin in some way makes all the difference in where we will go. The baptism of Jesus declares that the circumstances of our lives are held in the font of God’s life, love, and presence. In every one of those circumstances we choose to live into or away from the baptismal truth God speaks about us. All of our relationships and every one of our life’s circumstances invite us to return the waters of our baptism and to then walk back into the world dripping wet. Awesome reminder, and great perspective thank you! I think that question – Into what then were you baptized?” – can be a powerful guide as we make choices and live in relationship. This is one of the most accurate descriptions of my depression that I’ve ever read. So much so I nearly ended up crying at a bus stop! Thank you so much for this sermon, it’s both something I really needed to hear, and a wonderful thing to ponder when things do get bad. God bless you. Helena, thank you for your comment and for reading my blog. I am glad the sermon was meaningful and hope it helps guide you back to the baptismal waters of life.